So-called ‘mystery religions’ were at the core of paganism in ancient Europe. Many ‘gods’ were used to illustrate the fundamental ideas of commonly-shared philosophies, ideals and empirical observations of nature and existence among ancient Europeans. Their ‘mysteries’ were a method of communicating the dynamic interplay of such forces through the participation of suppliants in story, ritual, drama and ceremony, often through means of ‘initiation’, usually followed by ongoing participation. This communicated higher knowledge and understanding in an intimate personal manner which could not ordinarily be achieved simply by listening to or reading stories. As many of these mystery religions existed within the Hellenic and Roman polities of Europe, North Africa and the Near East we know at least a little about them from archaeology, art and literature which has survived from the Iron Age, Classical and Late Classical eras (8thC BCE to 5thC CE). Because the exact nature of the mysteries was secretive, we are often left guessing about exact details of ritual and ideology. However, we have even less information about the indigenous mystery religions among the Atlantic Europeans or ‘Celts’ whose independent cultural direction was largely crushed or assimilated by the Roman Republic and Empire between the 2ndC BCE and 2ndC CE. To be an ‘initiate’ in these old European mysteries usually involved submitting oneself to its priests or guardians at a site sacred to the cult. Once there, one would subsume one’s mundane identity into that of an initiate and participate in a number of dramatic performances designed to illustrate the principles of the cult in an atmosphere of mystery, awe and (eventually) revelatory ecstasy. The initiations would be designed to impress a set of ideas onto the initiate which would have a profound influence upon their worldview, while leaving them with questions only partly answered by the immediate experience in order to encourage further participation in the cult, or encourage dialectic philosophical exegesis of the epiphany the initiate had experienced. At the height of their popularity, initiates would come from nearly every walk of life, from slaves up to Emperors and Kings. The great Augustus himself – inheritor of Julius Caesar’s posthumously-declared empire took a particular interest in the mysteries of Eleusis which, as we shall see in the light of Caesar’s commentaries on Celtic religion, is somwhat interesting. The mysteries were generally secretive, so apart from external observations and some archaeological paraphernalia and written ephemera, we actually have a very limited idea of what they involved or exactly what they were trying to communicate. We don’t know exactly what happened at the convocations of the various mystery cults at the various stages in their existence, but we do now that they had an influential effect upon the societies they operated in. Literary evidence for ‘Celtic Mysteries’? It is hard to determine from Caesar’s account if Druidism was indeed a ‘mystery cult’ in the Greek or Roman sense, or a highly advanced system of education and cultural indoctrination. Caesar talks of ‘the Gauls’ as a unified whole, and many of them certainly unified to fight him in the 1stC BCE. However, Celtic culture seems to have been historically riven and even driven by intertribal warfare so we must be cautious about his opinions. What does strike me as relevant to the Mediterranean mystery cults is the pre-eminence he accords to cthonic and psychopompic deities and the idea of reincarnation. This suggests Gaulish/Celtic religion shared similarities with the Greek mysteries, and could conceivably have shared common origin with them. The first Roman Emperor, Augustus (ruled 27BCE-CE14), is notable for his eventual establishment of an internally stable Roman home province which would remain stable for almost 200 years. He took the reigns from his murdered adoptive ‘uncle’ Julius Caesar, who had expanded the Republic’s territories and cultural influence from Celtic Gaul to Egypt. Subsequent years would see consolidation of Roman influence over Germania west of the Rhine, the Balkan regions of Pannonia and Moesia, as well as Macedonia and Thrace. This, to the Romans, constituted a matter of great pride as they had conquered the greater continental portion of western Europe whose people were known to the Greeks and Romans as ‘barbarians’: a people at once considered to be backward, unsophisticated, frighteningly violent, and yet still mysterious. 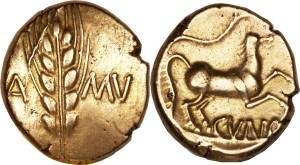 Stater of Tasciovanus demonstrating Eleusinian symbolism – influenced by Augustus? Of course, the interest of these Belgic leaders in the Greek mysteries would have been a strong statement of alliance with the worldview of Augustus and his successors. For Augustus himself, it is entirely possible that his own devotion to the Eleusinian Mysteries was designed to better understand the religious worldview of the ‘barbarians’, which the Greeks appeared to have had civilised, and who he was continuing to conquer or gain as allies for his new Empire. The implication might be that the new Emperor felt he could find common religious origin with his newly conquered peoples and allies. The Greeks certainly believed the mysteries to have originated among the barbarians, but to have been civilised in Attica. Of course, the exposure of Celtic peoples to a cult which dealt with the mysteries of death was far greater than that experienced within the Roman culture. Caesar blamed the apparent fearlessness of Gaulish warriors on a firm belief in reincarnation, indoctrinated into them by the Druids (supposedly originating in Britain), and his successors would spend a good deal of time, money and human lives in eradicating this movement. The origins of it are to be found hundreds of years further back in time, perhaps when the great Celtic warbands formed and stamped their mark on Europe and the Near East from the start of the ‘La Téne’ period. This was the ‘Belgic’ cult which venerated the solar god Belenos as receiver of the dead and lord of the Otherworld. He was equivalent to Apollo, whose most significant shrine at Delphi was famously assaulted (and possibly thoroughly pillaged) by a Gaulish army in 279BCE. Belenos was the god who promoted growth and decay – the sun who grows vegetation and at the same time hastens putrefaction of the dead. His domain included the lands of the daytime as well as the lands beyond the setting sun – the realm of the Celtic dead. Like the ancient Mars-Quirinus he was a god of war and chthonic fertility. Like Apollo he was a conqueror of serpentine decay and giver of oracles. Like his later development as Wodan/Odin, he was a god of battle-fury and madness – a shaper of madness into purposeful action, which is in fact the political aim of warfare. The mysteries of Belenos were never attested, but the evidence that they existed is reasonably compelling from the opinions of Caesar and the god’s replacement by Apollo in the post-Romanised era at Romanised cult-sites among the Gauls, Britons, Iberians and Germans and in the Balkans. The imagery of this religion could be found inscribed on the coins and monuments of the Celts, although the latter ocurred after the advent of syncretism post-Romanisation. It is evident on the designs and decorations on personal ornaments and weaponry, and on spectacular artefacts such as the Gundestrup cauldron. Compelling writing and full of interesting connections. I love the idea of a balanced power in the sun, of both growth and decay, and I have explored some faint traces of sun worship linked with daughters of the sun here in Scotland. Symbolised in sun beams and holy wells….linking them to both the daytime world and the otherworld…. The ‘solar’ gods (Manannan, Apollo, Dionysus/Sabazios, Belenos etc) were typically gods of ‘epiphany’ in legend – they came and went, created and destroyed – a good comparison with how men can sometimes be in womens’ lives. I think this nature of the sun was the reason the Cailleach legends often seem to portray her as singular and estranged from a life partner – sometimes in conflict with him in certain stories. I’d be interested to hear about the Scottish ‘Heliades’ – I was always intrigued by the Hyperborean traditions of ancient Greece and the connection between Phaethon and Python, and Apollo’s syncretiistic Delphic link to both via his annual visit to ‘Hyperborea’ when the god temporarily ‘left’ Delphi, and the cult invited Dionysus as house-sitter (presumably the Pythonesses went on holiday to recover their sanity), The Heliades were said to have been transformed into Poplar trees on the banks of the river Eridanus bordering Hyperborea, weren’t they? They cried tears of amber over their brother’s fiery death in the swamp. Eridanus is a Stygian water, if ever there was one… the geographical inclination of the Hyperborea traditions seems to suggest Scotland to have been as good a place as any to fit its archetype, for ancient minds at least. To me it has always seemed to fit well, and the Greeks mentioned a circular temple of the Hyperboreans far in the north, where the gods walked the earth every 18 years! Perhaps you are referring to the temple of Kronos mentioned by Plutarch in ‘Moralia’? Thanks for the interesting read. I’ve recently become interested in contemporary Druidry and the pre-Christian Mysteries, so this added to the picture I’m building. Thank you.